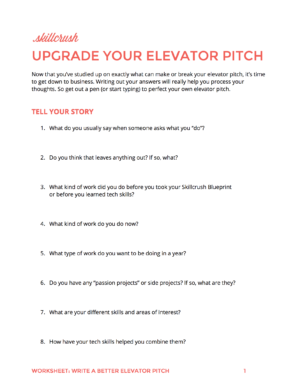 Use this FREE 3-page worksheet to create or refine your elevator pitch. Everybody dreads the idea of giving an elevator speech. 60 seconds. Trapped in a tiny moving box with someone who could make or break your career. AND you’re supposed to wow them with a mini-pitch all about you? How is that NOT nerve wracking? The thing is, it doesn’t have to be. With just a little bit of preparation you can craft an elevator pitch that you’ll want to shout to the world—and we’ll help show you how. Chapter 1: What IS an Elevator Pitch? Chapter 2: What Makes a Great Elevator Pitch? Chapter 1: What is an Elevator Pitch or Elevator Speech? Before getting into the specifics of an ideal elevator pitch example, it’s helpful to understand exactly what an elevator pitch is and what it’s used for. While elevator is in the name, an elevator speech or elevator pitch is really just a concise and snappy way of explaining your career story to other people—regardless of who they are or where the speech takes place. So yes, you’ll want your elevator speech to be effective with people you meet while moving between floors, but a well-crafted elevator pitch will also serve you at any kind of meetup, party, conference, or unexpected run-in at the grocery store. You never know where you might rub elbows with potential employers or clients, and their decision whether or not to hire you can happen in the blink of an eye. Your well-prepared elevator speech is a frontline tool for influencing that decision in a positive direction. With the nots out of the way, here are the steps you need to follow toward writing elevator speech examples you can be proud of. As cringe-worthy as it feels to elevator pitch yourself to a client or employer, that’s not what makes coming up with great elevator speech examples so difficult. The tricky part is coming up with concise but cohesive story about yourself that’s accurate, but ALSO positions you to get what you want—whether that’s a job offer, a business card, or just a firm handshake. An elevator pitch isn’t your whole life story, and it isn’t even the highlights. Instead, it’s the one to three things you want to emphasize about you and your ambitions. Cater your elevator pitch examples to the situation you’re in as much as possible. If you’re at a tech conference, it might not be the best moment to talk about your Etsy shop, and if you’re talking to a blogger you admire, it makes more sense to focus on your own blogging goals than the professional duathlon you placed in last summer. Instead of overwhelming listeners with your whole story, only include the parts of your story in your elevator pitch example that are relevant to the specific situation. What are YOU interested in? What kind of work do you want?Before you can write an elevator pitch that will help you reach your goals, you need to know what those goals are. Once you know what you want, it’s easier to portray yourself in a way that makes sense. 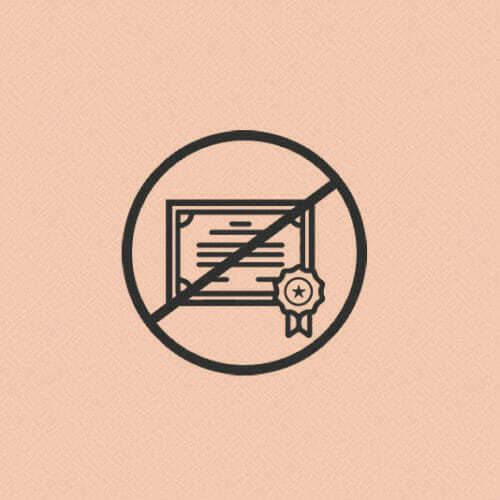 For example, if you really want to be a web designer, you should emphasize the web design work you already do rather than spending a lot of time on the dead-end job you want to ditch. And if you want to be a data-driven marketer, use your elevator pitch example to talk about your marketing background and how excited you are about data before you mention the 5 years you spent as a banker. Your elevator pitch is only valuable if the person you’re talking to understands it. In the same way you should cater your elevator pitch to the specific situation, you should do as much as you can to craft your pitch based on the person you’re talking to. Watch your business vocabulary-slash-jargon as well. Don’t throw a ton of developer acronyms at someone outside the tech industry, and don’t bog down your elevator pitch example over-explaining Facebook marketing to a social media marketing pro. For instance: instead of elevator speech examples that say you’re a customer service specialist, say that you communicate with customers and keep them happy throughout their experience with your brand. Or instead of saying you’re a copywriter, say that you help entrepreneurs and businesses create content that converts users into customers. If you’re ever thrown into a situation where you weren’t expecting to need prepared elevator pitch examples, a good fallback is to describe your day-in-the-life. So rather than saying you founded a nonprofit, say that you create opportunities for underprivileged girls to learn how to code. 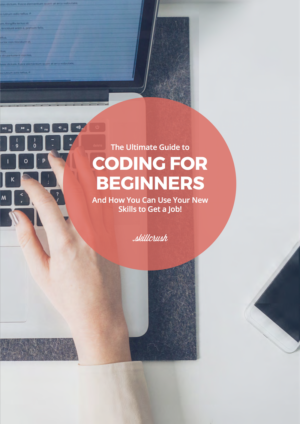 Rather than saying you help girls “learn to code,” say you help preteens learn HTML and CSS. Maybe even include how many kids your company works with annually in your elevator pitch. More details are more memorable. You don’t have to say everything relevant at once. If you’re interesting, they’ll ask for more. Start with one or two tidbits about yourself as go-to parts of your elevator speech examples, and see what makes the person say, “Ooh, wow!” You’ll figure out what they’re interested in, and then you can share more information according to their interests. Sam Horn, author of Got Your Attention?, throws the whole idea of an elevator “pitch” out the window. Instead, she likes to think of it as an elevator conversation. Rather than taking a big gulp of air and spewing your story, find a way to make your spiel relevant to your listener right away. Another important thing to consider when wondering how to write an elevator pitch is that you don’t have to start from scratch. When it comes to drafting a great elevator pitch—even if your situation feels unruly or unique—others have probably had the same trouble talking about themselves that you’re having, meaning there’s always an elevator pitch template you can start with. 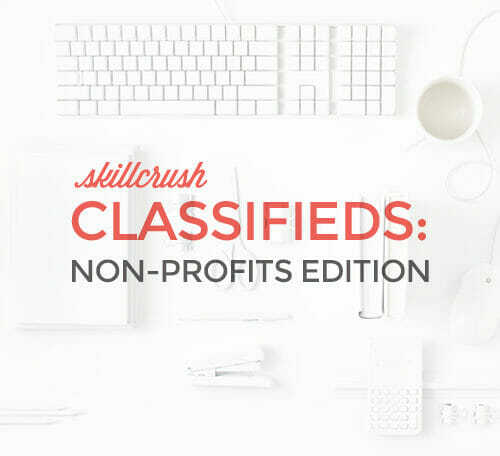 To show you how common these kinds of circumstances are, I found three Skillcrush students and alumni who have their own situations to explain. 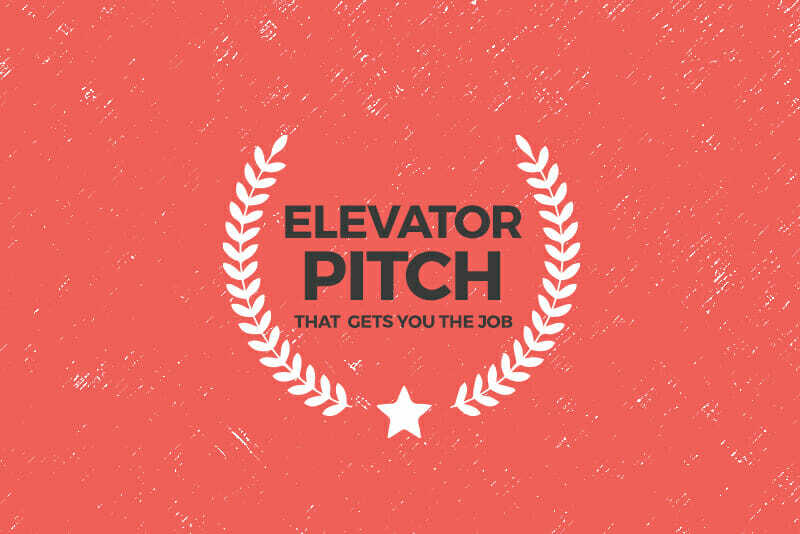 So take a look at these elevator pitch examples for students, career-changers, or anyone looking to up their career game, and see if your story aligns with one of them. Maybe you can take a page from their book—or, you know, three or four sentences. And, when you’re done adding these elevator speech examples to your own repertoire, don’t forget to download our free elevator pitch template from the form below. Sound familiar? Well, fuhgettaboutit! If you’ve actually done the work, there’s no need to feel unsure. Don’t oversell yourself but DON’T sell yourself short. And, if you’re a stay-at-home parent, you can definitely connect the amazing work you do raising a family with the amazing work you do online. New Elevator Pitch Example: I’m a web designer who’s making the Internet a more beautiful and positive place! My background in counselling helps me understand what the bloggers and small business owners I work with need. And, thanks to working in administration AND now being a stay-at-home mom, I’m great at coming up with solutions, no matter what you throw at me. Analysis: As Monica puts it: “I do so much but it doesn’t fit into any PERFECT MOLD and not much of it is paid, so I usually downplay what I do.” She’s concerned about having been out of the workforce for 15 years and says she’s just done “small jobs” in tech. But there’s no reason for Monica not to talk about her work just because she’s not getting paid for it—yet! 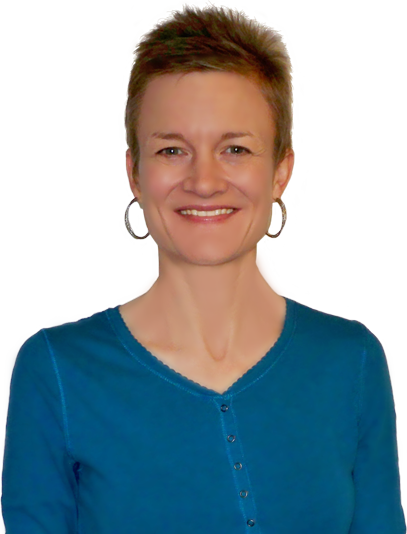 She’s built websites and trained private individuals and companies to use their technology, so she has every right to claim those digital skills as hers! New Elevator Pitch Example: I’m a technophile and web developer specializing in testing, website maintenance, and tech support for small businesses. And I’m also passionate about being a mom and a co-owner of a medical business. It’s scary and not a decision to make lightly, but—once you’ve set your sights on a new career— it’s time for to leave the past behind and focus on the future. So make sure your pitch is up-to-date too. New Elevator Pitch Example: I’m a tech triple threat — designer, developer and digital project manager. My superpower is my organizational skills paired with my creative background in photography, graphics, and social media marketing. And, currently, I’m part of a team developing a social networking app. To make it super simple for you to get your own pitch ready, just download our fast and easy elevator pitch template worksheet from the form below. 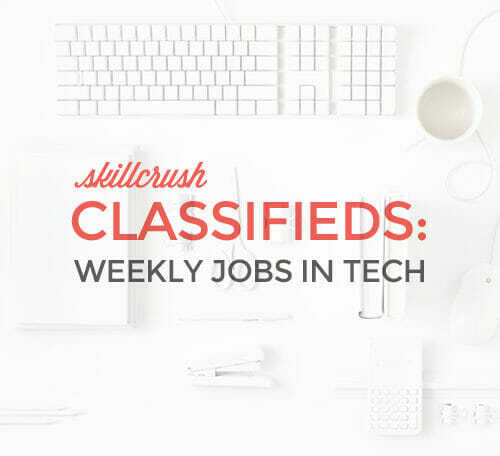 It will take you through the process of crafting exactly what to say to get the tech job you’ve been dreaming of.